The Human Resource Management Certificate is designed to meet the diverse goals of the student and thus, several different types of students will find the certificate program attractive in meeting their individual needs. The program is designed to attract the newly promoted professional, the professional seeking preparation for career advancement as well as the student seeking to enter the job market. In addition, the program is geared towards preparing students for the Human Resource Management Certification examinations. Students may elect to take one course or earn the certificate by completing the eight courses. If the student later decides to pursue a degree program, credits earned as a certificate student will apply to most degree programs. 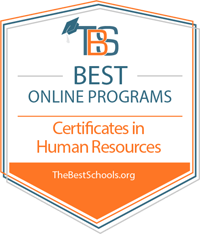 The Certificate Program is designed to provide a comprehensive, competency-based, educational experience that will equip students with the skills necessary to become successful human resource management professionals.